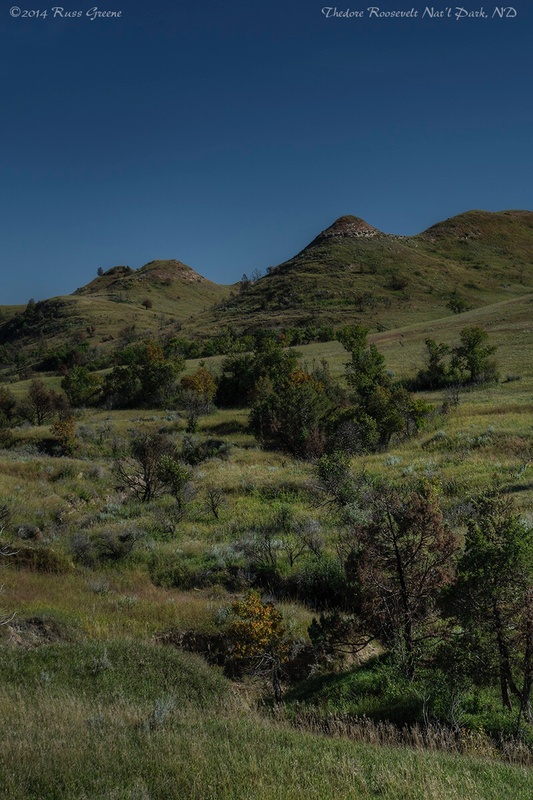 I was reminded of that joke yesterday when driving the 14 mile park road in the North Unit of Theodore Roosevelt National Park, North Dakota. I came to a sudden stop to avoid hitting a motionless snake in the middle of the road. 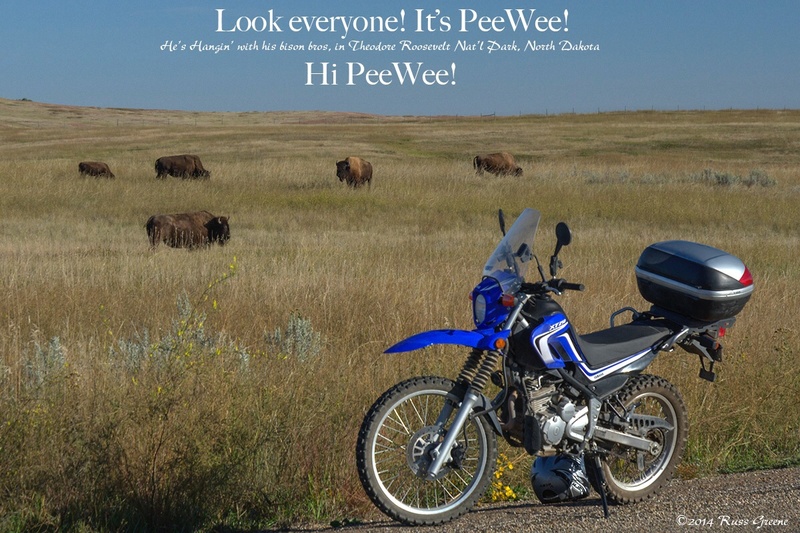 I climbed off PeeWee–my trusty little Yamaha XT250 motorcycle–to have a closer look. I could see it was a rattlesnake so I wanted to be very careful before assuming it was dead. As I circled the creature at a safe distance–they can’t strike without first coiling up and even then their striking distance is short, generally preceded by rattling–it looked pretty dead to me but as I moved around to its side from the back I saw the telltale flickity-flick of the snake’s tongue, a sure sign that it was anything but dead. It occurred to me that if this snake remained where it was it wouldn’t be all that long before it was in fact dead. After all, the place where it had apparently stopped to sun itself, was smack dab in the middle of the road, perpendicular to it with its head and half its body on one side of the yellow line, tail and other half of its body on the other. Lightly traveled as the road has been since I’ve been here, it’s still got traffic if only a passing car once every 5 or 10 minutes. I found myself in something of a dilemma: leave the snake alone to suffer an almost certain death or convince him to leave to road for safer environs. The much feared and maligned rattlesnake does play an important role in the ecosystem and it is us intruding on his space, not the other way around. I figured I owed the creature. Believing I knew enough about the dangers and habits of rattlesnakes I opted to convince him to leave the blacktop despite its delicious warmth during the cool morning and decided I would try to shoo him (or her) off the road by rolling up close on my motorcycle. PeeWee, after all, is fearless. This way if the snake chose to strike he’d probably wind up with a fang full of tire, not flesh. The dang critter seemed unphased by PeeWee’s approach, however, even though we rolled up to within and inch of him. It was then I remembered that snakes are sensitive to vibration so I revved PeeWee’s engine a time or two and sure enough this got the snake’s attention. He wasn’t too happy about it all and made it known by rattling at us. Nevertheless, as we approached the snake from the side near its tail and revved away, the creature moved slowly toward the side of the road. It never turned to face us or to coil in self defense as it would have to do in order to strike. It just expressed it’s displeasure by rattling and moved off into the bushes. Now, had it been a lawyer in the road…? This snake was not the only interruption I experienced while traveling the park road. I traveled it four times and each time had to contend with a herd of bison straddling the asphalt ribbon. PeeWee convinced them to leave the road too, but doing so was much more worrisome to me than that itty bitty snake. The bison turn to face you keeping you dead in their sights and it’s difficult to tell if they are getting pissed off and ready to charge or if they are just wary. It seems from my recent experiences the latter is more likely because they all turned tail to run and none even bluffed a charge. 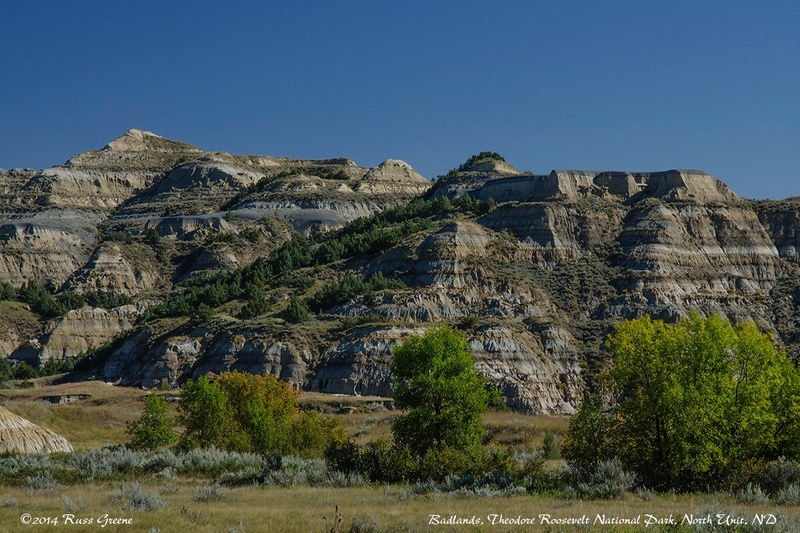 As to Theodore Roosevelt National Park, I really didn’t know it existed until some folks I met in Yellowstone recently told me about it. They said it had badlands. When I heard that I was hooked. 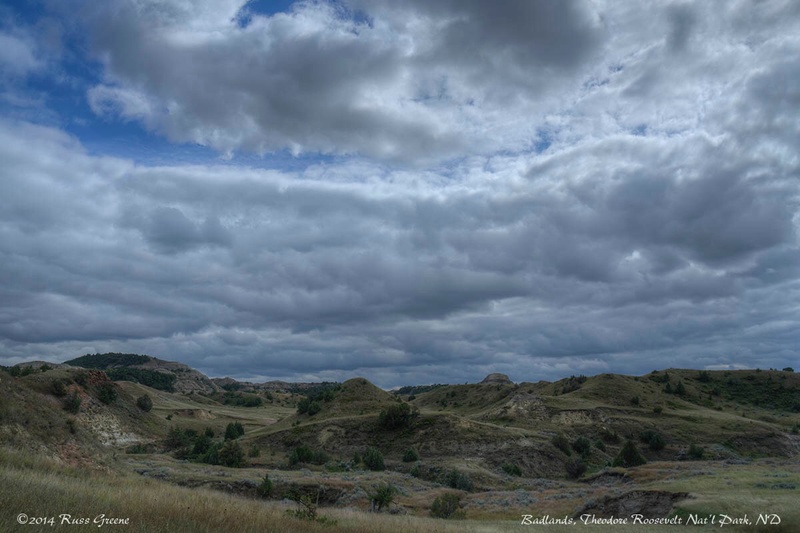 I’d been wanting to see badlands for some time, wondering what was so bad about them, and had in fact planned to go to Badlands National Park in South Dakota but decided to wait awhile on that because it was too hot there at the time. 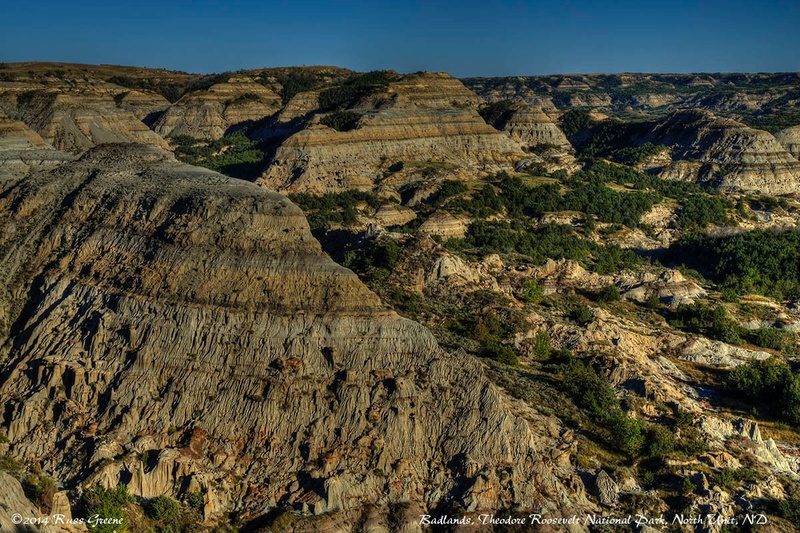 It turns out the badlands in Theodore Roosevelt National Park are beautiful lands, and steeped in history including some about its namesake. None other than Theodore Roosevelt himself lived here. He ranched here. He came here for solace when his young bride and mother both died the same day, in the same house where he lived in New York. The park has three units: the north, south and Elkhorn Ranch, the latter being the location of Roosevelt’s Elkhorn Ranch home. It no longer stands and I didn’t visit that unit, but I spent several days at the Cottonwood campground in the south unit before coming here to the Juniper campground in the north unit. Look everyone! It’s PeeWee! 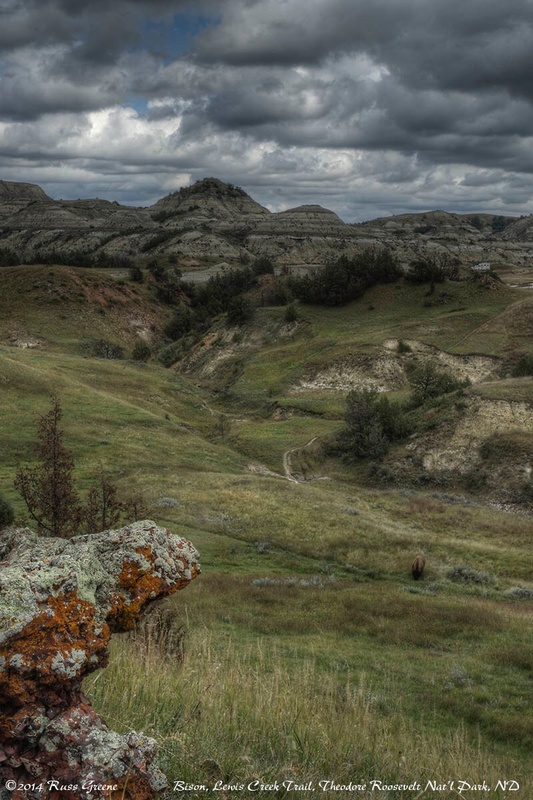 He’s in the Badlands of Theodore Roosevelt National Park, North Dakota. 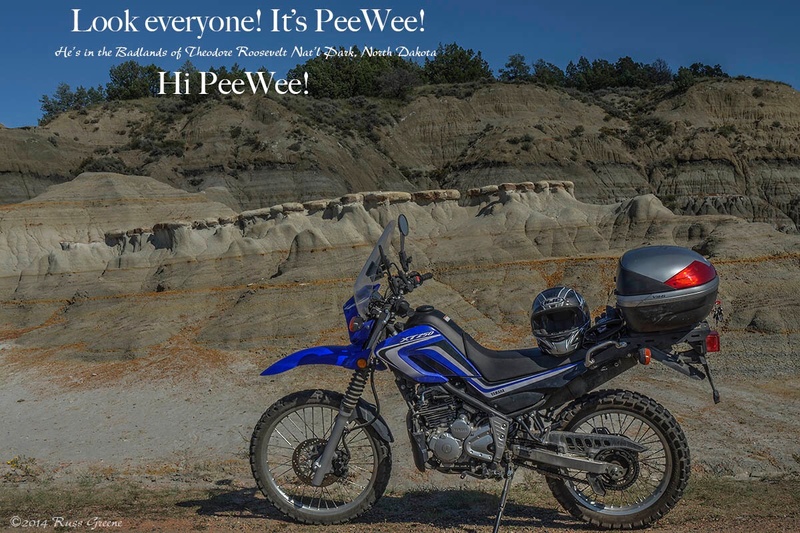 Hi PeeWee! 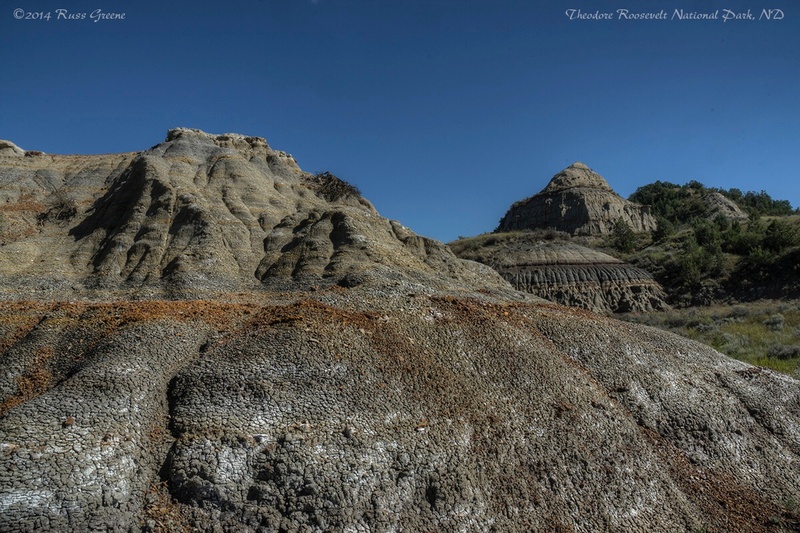 The badlands are interesting for many reasons one of which is the geology. Another is the wildlife which includes bison, coyotes, birds of prey, elk, feral horses, prairie dogs, pronghorn antelope and bighorn sheep among other species. For me, well, I enjoy beauty and the landscape here is beautiful, really beautiful. Here I found a rich tapestry of subtle nuances of color alongside interesting shapes and form. I expect it may have more vibrant colors earlier in the season before the greens of spring grasses and the new leaves on the trees begin shifting toward the yellows, browns and golds of autumn. 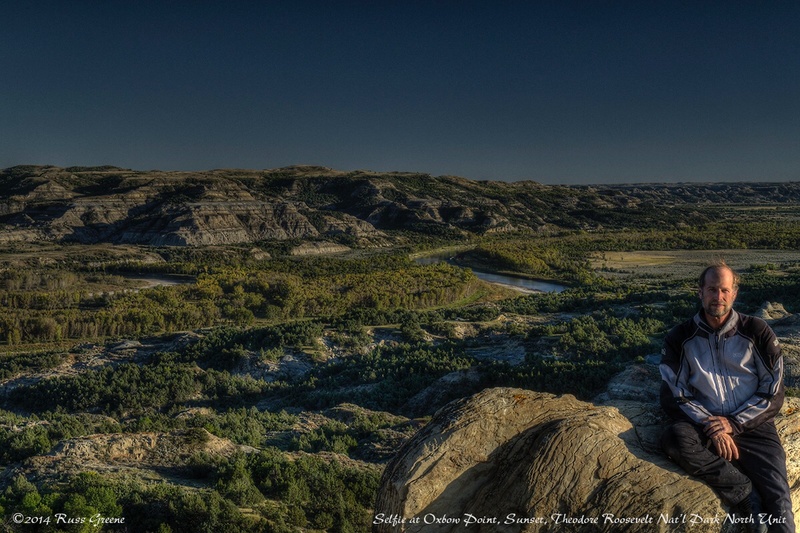 The striated, eroding hills of the badlands create a visual counterpoint to the valleys that lay between them and the surrounding grassy prairie. I’d imagined North Dakota as a frozen wasteland, perhaps because of a weather report I’d heard as a child saying it was -40º in Bismark. Well, yesterday, in mid September, it was 75º and the forecast for the balance of the week is much the same. OK, last night it was 30º but I was snuggled up warm in my bed. There is some evidence here of the big oil boom going on in North Dakota right now–I saw one of those rocking horse type pumps, or whatever they are, off in the distance as I drove the park road. I heard from my campsite neighbors who had just been north of here and from one of the Park Service grounds-keepers that there is a whole lot of trucking, temporary housing and road construction. Indeed, traveling route 85 both to and from the park the road was busy with a great many trucks bringing to and taking from the oil boom areas whatever they take and whatever they to bring. As I drove out of the park this morning in the early morning light there were many times I wanted to stop and photograph its breathtaking landscape, but could not because there was no place to park along the road. I don’t think my photographs do the landscape justice, which I’ve often found is the case between being there and looking at a photo. 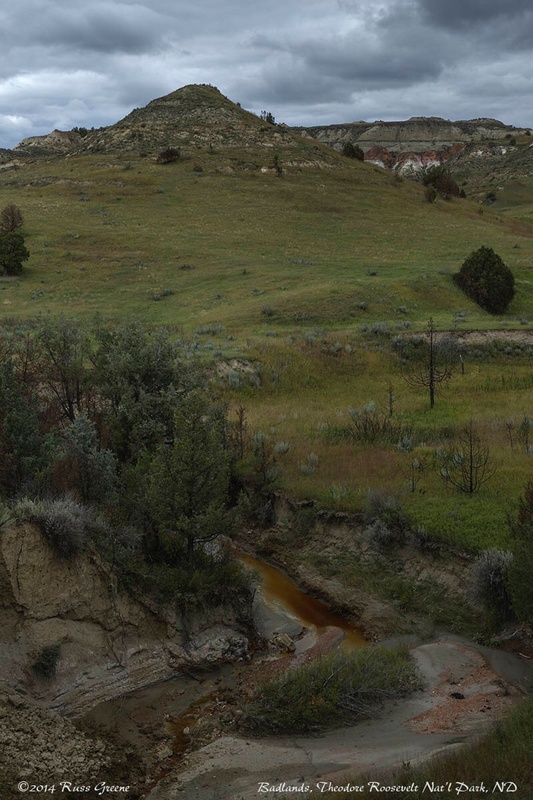 While it doesn’t have the towering granite peaks or waterfalls tumbling hundreds of feet such as those you’ll find in a place like Yosemite, Theodore Roosevelt National Park has a magic of its own and by which I was moved. Oxbow point is at the terminus of the park road in Theodore Roosevelt, North Unit. I posed for this photo at sunset.